The exciting vision of utilising satellite data to their full potential in policy development and operations by 2020 in Defra’s Roadmap for the use of Earth Observation (PDF) is being taken forward in many Defra work areas and with many partners, including the UK Space Agency’s Space for Smarter Government Programme (SSGP). 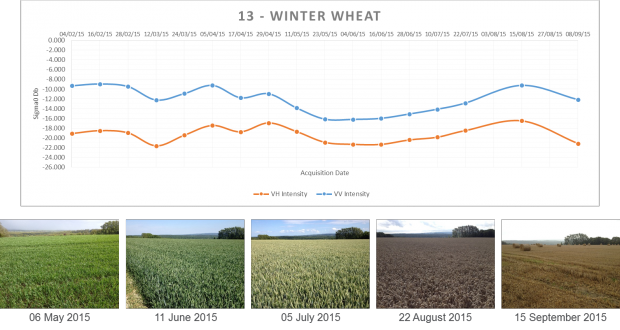 Defra embarked on its journey to explore the potential of satellite data with SSGP more than two years ago and we can now see the wide ranging benefits of the relationship. These include the inception of Defra’s Earth Observation Centre of Excellence, SSGP’s continued engagement with the Centre through partnership working, and the alignment of a number of SSGP competitions with areas of Defra interest. In the autumn of 2015 SSGP ran its latest competition using the Small Business Research Initiative (SBRI), supported by Innovate UK. Funding was awarded to 10 project teams, with projects running for five months, culminating in March 2016. Three of these projects address challenges of relevance to Defra. The projects focused on plant health, marine monitoring and rural payments have engaged with Defra officials post award of the contract to discuss how the research can deliver specifically to Defra policy requirements. 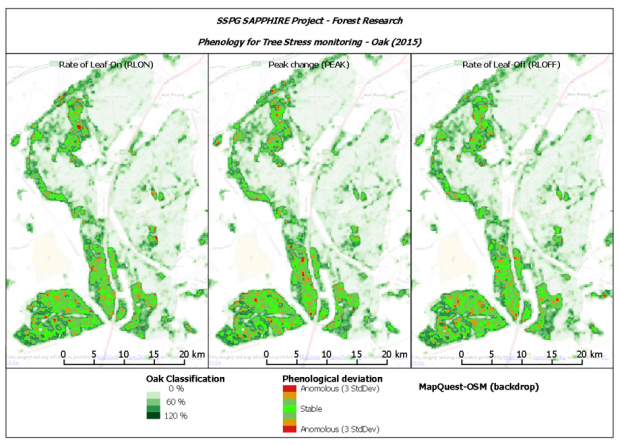 The Space Applications for Precision Plant Health Information, Response & Evaluation (SAPPHIRE) project was led by Rezatec in collaboration with Forest Research. The project aimed to respond to difficulties associated with obtaining accurate tree distribution by species, especially broadleaf species, and to address the lack of contemporary data of tree species distribution and abundance needed to predict the progression of forest pathogens. The Earth Observation: Marine Strategy Framework Directive (MSFD) monitoring, ecosystem capacity, natural capital valuation project was led by Plymouth Marine Laboratory. 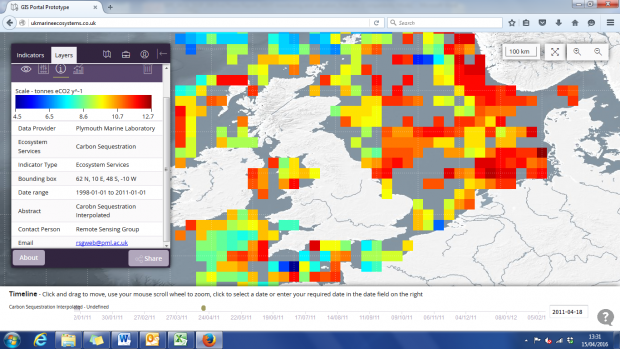 The aim of this project was to develop an innovative, interactive web-based visualisation tool that uses Earth observation data on phytoplankton, particularly ocean-colour data, to generate new products that serve and inform (i) statutory marine monitoring requirements, (ii) ecosystem service capacity assessments and (iii) natural capital capacity accounting. The Sentinel-1 in Support of CAP Compliance Checks project was led by Remote Sensing Applications Consultants Ltd in collaboration with Airbus DS. It aimed to meet Defra’s challenge of “How can Copernicus Sentinel-1 data be used in fulfilling Defra’s monitoring requirements for CAP compliance?”. In 2015, the CAP Basic Payment Scheme was introduced, which includes new greening requirements for crop diversification and establishment of Ecological Focus Areas (EFAs). EC regulations require national administrations (Rural Payments Agency in England) to undertake detailed checks on 5% of farmer applications each year, and this is now mainly carried out using remote sensing controls. The projects will present their findings alongside other SSGP projects in the beginning of June to an invited audience from the public sector, at which the Earth Observations Centre of Excellence and other Defra officials will be present. If you would like to attend the event contact the SSGP team at ssgp@sa.catapult.org.uk before Thursday, 2 June for an invitation. Please note spaces may be limited. After this there will be a second phase of this competition, where these projects will be able to apply for further funding to develop their services and applications to operational ready level. Defra and the Earth Observations Centre of Excellence will continue to work in partnership with SSGP on the second phase to help deliver outputs that have impact on operations and policy relevant to Defra. If you want to know more please contact the Earth observations team at earth-obs@defra.gsi.gov.uk or the SSGP team at ssgp@sa.catapult.org.uk.